Is Someone Cloning Your Identity? August 2001 IBEW Journal I've Been Robbed! You can minimize your risk of identity theft by taking some precautions when handling or revealing your personal information. Dont reveal personal identifying information unless you know how it will be used and whether it will be shared with others. Determine whether you have a choice about how your information is used; can you keep it confidential? Pay attention when you receive your bills. If a bill doesnt arrive, check with the creditor to find out why. A missing bill could mean a thief has appropriated your account and changed the billing address, so youre not receiving a bill anymore. Protect your mail. Deposit outgoing mail in postal service collection boxes or at the post office. 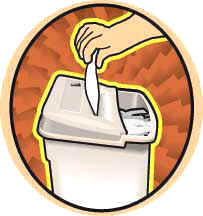 Dont let mail linger in your mailbox; remove it promptly after delivery. Place passwords on your credit card, bank and telephone accounts. Dont use easily obtainable information, such as your mothers maiden name, your birth date, the last four digits of your Social Security number or phone number, or a series of consecutive numbers. Carry only the minimum amount of identification and cards you actually need each day. Dont reveal personal information on the phone, through the mail or over the Internet, unless you initiated the contact or are absolutely sure with whom you are dealing. Thieves pose as bank employees, Internet service providers, solicitors for charities, utility telemarketers and government officials to persuade you to reveal your personal identifying information. Remember, legitimate organizations with which you do business already have the information and wont ask you for it. Others should be willing to send you written solicitations. Tear or shred charge receipts, copies of credit applications, insurance forms, bank checks and statements you are discarding, expired charge cards, and credit offers you receive in the mail. Dont leave items containing personal information lying around your home, especially if you have roommates, employ domestic help or when you have service work done in your home. Ask who in your workplace has access to your personal information. Be sure the records are kept in a secure location. Only reveal your Social Security number when absolutely necessary, and dont carry your Social Security card. Ask to use other identifiers, if possible. Every year, obtain copies of your credit report from each major credit-reporting agency. Verify the accuracy of each report, and that each one includes only those activities youve authorized.